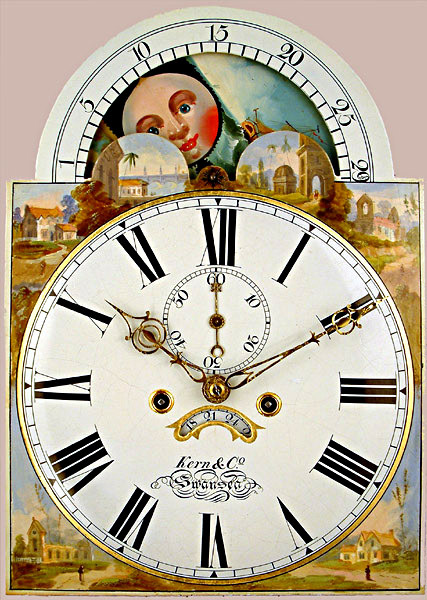 Kern & Co.Swansea Longcase Mahogany Circa 1850 - Height 85.5in. 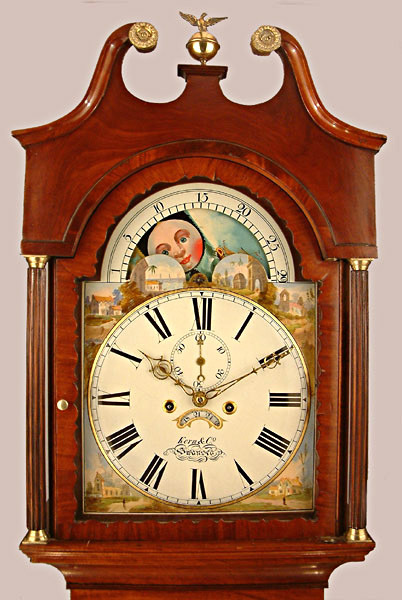 This Longcase Mahogany Archive's Maker - Kern & Co., Swansea. Kern, Joseph, 195 High Street, Swansea, 1835-71. See pages 85-87 of Swansea Clocks by Joanna Greenland, 1997. Mahogany case with swan neck pediment and central eagle ball finial. Ebony strung canted corners to trunk and ebony stringing above and below the trunk door. 13" breakarch painted dial with moonphase to arch. Seconds and date and brass hands. Kern & Co., Swansea. Kern, Joseph, 195 High Street, Swansea, 1835-71. See pages 85-87 of Swansea Clocks by Joanna Greenland, 1997.